The perfect introduction to PrimeFaces, this tutorial will take you step by step through all the great features, ranging from form-creation to sophisticated navigation systems. All you need are some basic JSF and jQuery skills. Overview Detailed explanation on how to use basic PrimeFaces UI components like form controls, panels, and layouts Delve into PrimeFaces advanced UI Components like Data Tables, menus, charts, file uploading, and themes Easy to read and learn with its step-by-step instructions in Time for action and What just happened sections In Detail PrimeFaces is a lightweight UI component framework for JSF based applications. PrimeFaces is very easy to use because it comes as a single JAR file and requires no mandatory XML configuration. It provides more than 100 UI Components and an in-built AJAX support. It also provides theme support for UI components with more than 30 themes out-of-the-box. With PrimeFaces, developers can create rich user interfaces very easily. PrimeFaces Beginners Guide is a practical, hands-on guide that provides you with clear step-by-step exercises,that will help you to learn and explore the features of PrimeFaces. PrimeFaces Beginners Guide starts by showing you how to install PrimeFaces, create sample forms, and perform validations and then looks at various commonly used PrimeFaces utility components. Next, you will look into various basic text input components like form controls, Calendar, AutoComplete, and Rich Text Editor. Then you will learn about advanced UI components such as DataTables, panels, menus,and charts. Throughout the chapters we will be building a sample web application using PrimeFaces progressively that will give you a hands-on experience on using PrimeFaces effectively. You will learn how to create complex layouts using accordion panels, tab views, sophisticated menu navigations, breadcrumbs and much more. You will also learn how to display data using DataTable with pagination, filters, and lazy loading, and how to export data to Excel or PDF features. You will learn how to represent data in various formats like trees, charts, and TagCloud. You will also learn how to build an application supporting multiple themes. With this PrimeFaces Beginner’s Guide , you will learn how to use PrimeFaces easily and effectively. What you will learn from this book Explore built-in AJAX features and various PrimeFaces utility components Use Partial Page Rendering(PPR) and the JQuery Selector API Create forms with text fields, dropdowns, radio buttons and User Interfaces with advanced components like Calendar, AutoComplete, Star Rating, and PickList Discover additional components like file upload and download components and data table components to display data with pagination Filter support and export data to PDF or Excel sheet Display data using tree and TagCloud components Create a sophisticated navigation system using menus, multi-level menus and breadcrumbs and complex layouts using layouts, PanelGrids, tabs, and accordion panels Approach A guide for beginner’s with step-by-step instructions and an easy-to-follow approach. 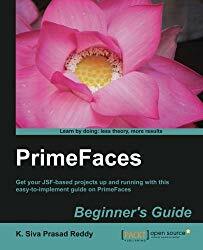 Who this book is written for PrimeFaces Beginners Guide is a simple and effective guide for beginners, wanting to learn and implement PrimeFaces in their JSF-based applications. Some basic JSF and jQuery skills are required before you start working through the book.